Oil covers Pensacola Beach in Florida's Panhandle in Late June 2010. TAMPA, Fla. -- As one of the world’s most beautiful beaches in Pensacola was marred by a 8-mile long swath of thick oil that washed ashore this week, a new study from a USF geologist paints a grim outlook for the sugar-like sands soon returning to their pristine state. In June, USF geologist Ping Wang traveled to northwest Florida and Alabama beaches to assess the condition of the world-famous sands where crews were cleaning beaches after Deepwater Horizon oil washed ashore. Wang reported that cleanup efforts still left tar balls and contaminated beaches. Wang’s observation comes in a report to the National Science Foundation following his studies along a stretch of coastline from Alabama’s Dauphin Island to the eastern end of Santa Rosa Island in Florida in early June. His findings are the first scientific documentation of the significant “beach-fall” of the Deepwater Horizon Spill on June 3. 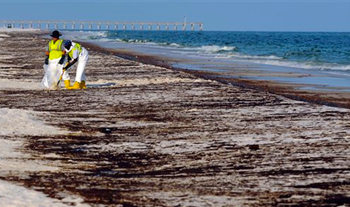 Wang returned to the area Wednesday as news reports broadcast startling pictures of a 6-foot-wide swath of oil on Pensacola Beach. Working with USF graduate students Mark Horwitz, Tiffany Roberts, Katherine Brustche and Jun Cheng in June, the team found tar balls were found along 160 kilometers (more than 99 miles) of the overall 180 kilometers (nearly 112 miles) of beaches they studied. Their report was delivered to NSF last week as part of the Coastal Research Laboratory’s effort to provide baseline beach condition and initial beach oiling. After studying 17 sections of northeast gulf beaches and six marsh areas in the eastern Mississippi Sound, the team from USF’s Coastal Research Laboratory found cleanup efforts don’t necessarily return the beaches to their pristine state. Manual beach cleanups still leave the sporadic appearance of tar balls in about 20 to 40 percent of the contaminated area, the researchers reported. The tar balls left behind were small, but researchers also found larger ones buried in the sand. Buried oil is more difficult to remove and may decay more slowly than the exposed tar balls, thus having longer term effects, Wang said. “When the massive landfall happens, it won’t be so easy to clean up,” Wang said, adding the research team continues to closely monitor the movement of the oil spill and will conduct another field study if major oil beach-fall occurs. Wang’s findings represent conditions along the studied stretch of coastline through June 9 and include results associated with varying degrees of beach cleanup. The intensity of the beached oil decreased generally from west to east, but the study was conducted before wind conditions began moving more oil toward northwest Florida shorelines. The researchers first traveled the northern gulf beaches May 7 to May 19 to gather baseline data on shore conditions. The oil spill, caused when the Deepwater Horizon oil drilling platform exploded April 20, continues more than two months later. The pre-beach-oiling data were collected along pristine beaches in state and national parks as well as heavily developed stretches of beach. In addition to examining the beaches for oil, the scientists conduct short coring operations to get a complete picture of beach conditions before the oil arrived. As many a tourist will attest, on their first trip in May the researchers found the soft, white quartz sand (aka sugar sand) that has made the area’s beaches some of the most famous in the world. But by the time they returned in June, those shores were marked with sticky tar balls, some as large as pancakes. Wang said he is not optimistic about what the coming months will bring. The strengthening of the summer sea breeze will provide stronger on-shore forcing to push the oil onto the beach, and the looming hurricane season remains a worrisome factor. “Based on numerous predictions, the summer of 2010 will likely be one of the most active hurricane seasons on record,” he said. 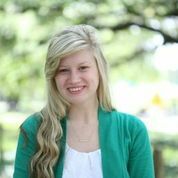 Savannah Deitch is a mass communications junior specializing in public relations and minoring in communication. After graduation, she hopes to work as a spokesperson of a large corporation and be a leader in the public relations field. She can be reached at savannah2@mail.usf.edu.